The main use of a modeling tool like Reveal Chromatography is to provide easy and fast ways to explore the space of possibilities, much faster than if only relying on experiments. This document presents two tools to do that. 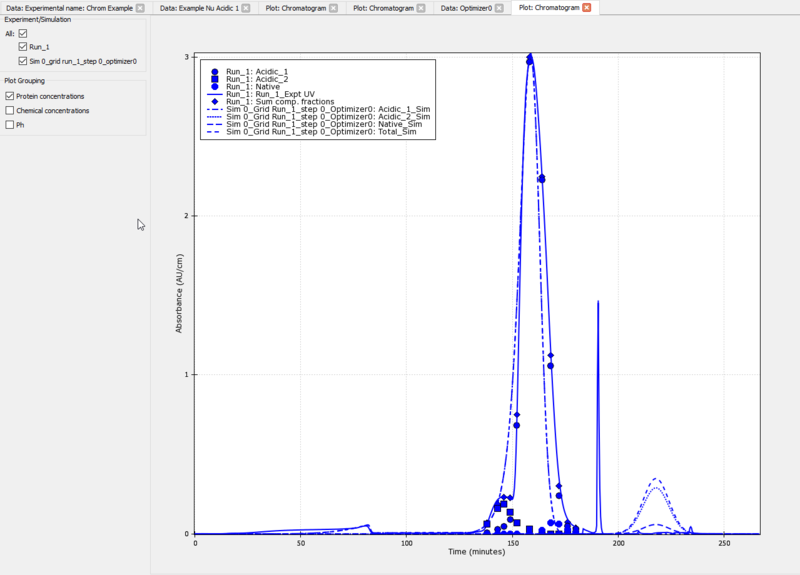 The Parameter Explorer is designed to explore the impact of one or more parameters on predicted chromatograms and performances. That can be be valuable both for model calibration as well as for process optimization/characterization. 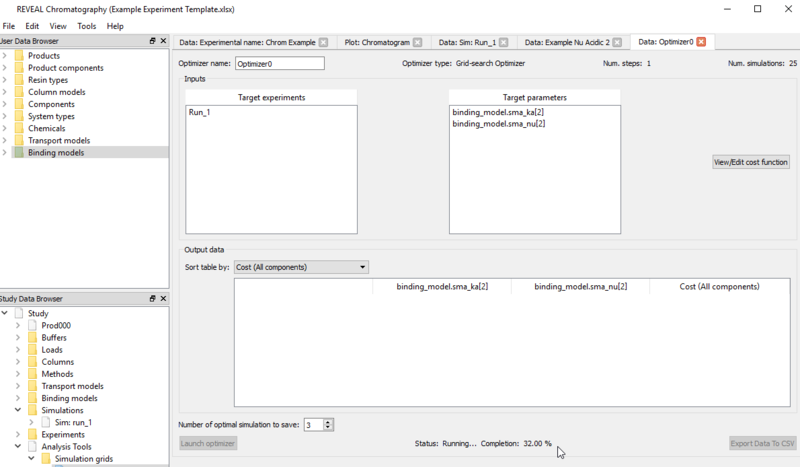 The second tool, the Parameter Optimizer is more focused on the model calibration part of the workflow, specifically designed to find the set of parameter values to best match experimental chromatograms. Reveal Chromatography can be used to create multiple simulations to study the effect of modifying one or more parameters at once, to study their impact on performances (yield, purities, ...) or on chromatograms during model calibration. In the software, these simulations can be created, run and analyzed together and therefore called a Simulation Group . A simulation group is created around an existing simulation, called the “center point simulation”, and its simulations only differ from that simulation by the set of parameters being explored. For each parameter explored, a set of values to scan is defined, and the group is made of one simulation per combination of scanned parameter values. There are two types of simulation groups: simulation grids, where scanned parameters take values sampled regularly inside some range, and Monte-Carlo explorations, where parameters take random values within a certain range. The first type of exploration is useful to build a systematic scan of parameter impacts, for example during model calibration or during process optimization. The second type of exploration is useful to model random process that can happen during operation, and is often done during process characterization. A random exploration, with a fixed set of simulations may also be useful when exploring many parameters/dimensions. 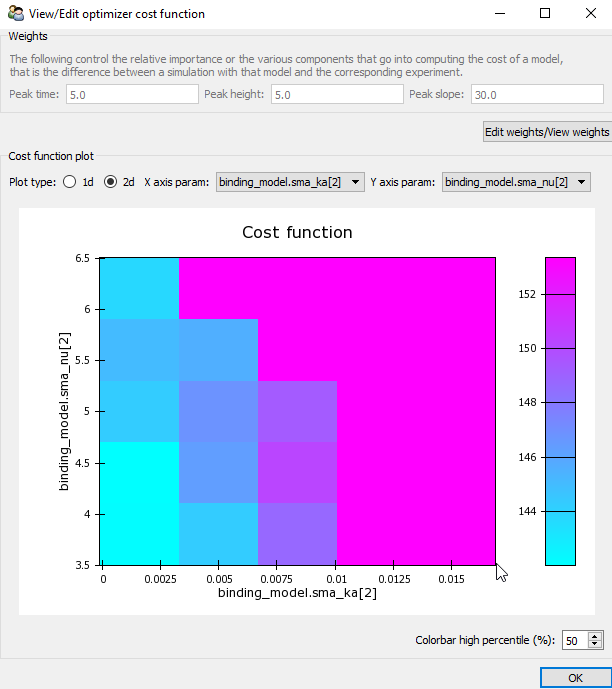 Building simulation grids allows modelers to explore a portion of the parameter space systematically and regularly. That can be useful during model calibration to find the best combination of model parameters to match experimental results (to that effect, see also Parameter optimizers). Grids can also be useful during process optimization to see what combination of operating parameters would lead to the best yield/purity. The name of the simulation grid. 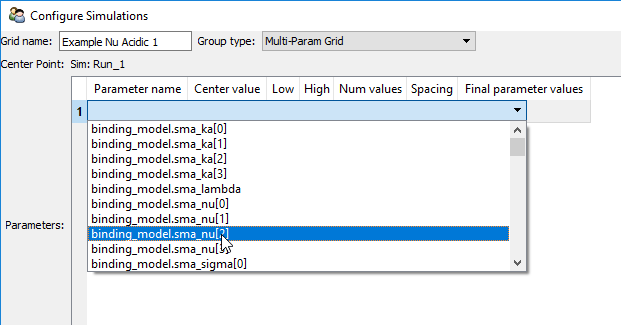 The type of the simulation group should be left as Multi-Param Grid. The “Source Simulation”, which is the simulation around which to build the grid. Once selected, the grid configuration table will automatically display the value of the parameter as set in the center point simulation in the Center value column (in this case 5.0 ). Press OK when finished configuring the grid to create it. The newly created grid will automatically open in the central pane. Users can also find it in the Study Data browser under Analysis Tools > Simulation grids. Instead of a regular grid exploration, users may want to explore a parameter space randomly, either because the number of parameters to explore is too large for a regular grid, or to do process characterization, and build a Monte-Carlo simulation of the possible outcomes of a process, assuming some uncertainties on operating parameters. The name of the simulation group. The type of the simulation group, which should be set to Monte-Carlo exploration. The size of the group, that is the number of simulations that should be generated to be part of the exploration. The “Source Simulation”, which is the simulation around which to build the exploration. One or more parameters for Reveal Chromatography to scan. To begin, click the New parameter scan button at the bottom of the open window (and repeat this procedure as many times as the number of parameters to scan). the parameters of this distribution. The two random distributions currently available are Uniform and Gaussian . Users should pick Uniform to specify that all random values should be picked all with equal probabilities within the range specified by the low and high parameters. Users should pick Gaussian if parameter values are not all equally probable, and rather follow a “bell-curve” around a central value (most probable value) and with a certain width (which controls how probable it is that the parameter will differ from the mean value). 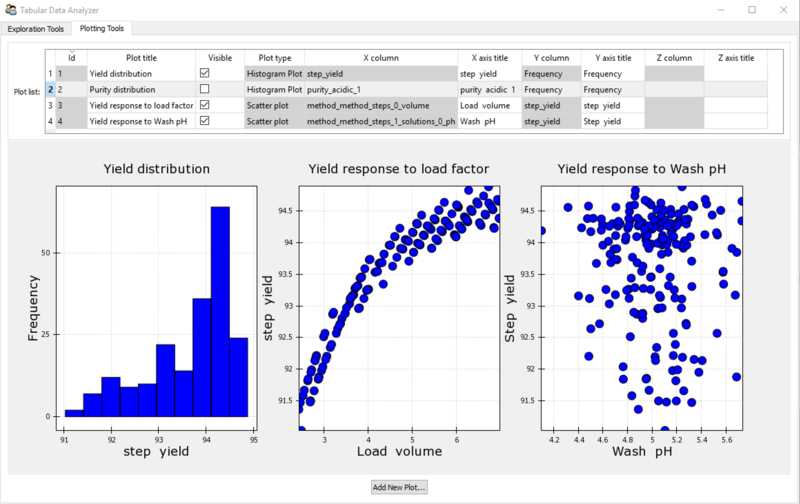 For example, during process characterization, a user wanting to model the manufacturing process may decide to model the impact of the wash step pH using a Gaussian distribution because that is a well controlled parameter and most values are close to some target value, but model the impact of the load volume as a Uniform distribution between two values because of some equipment constraints. When the Uniform distribution is selected, the two distribution parameters are the lowest and highest allowed values, respectively. When Gaussian is selected, the two distribution parameters are the mean (target value) and the standard deviation (from that mean), respectively. Press OK when finished configuring the group to create it. The newly created group will automatically open in the central pane. 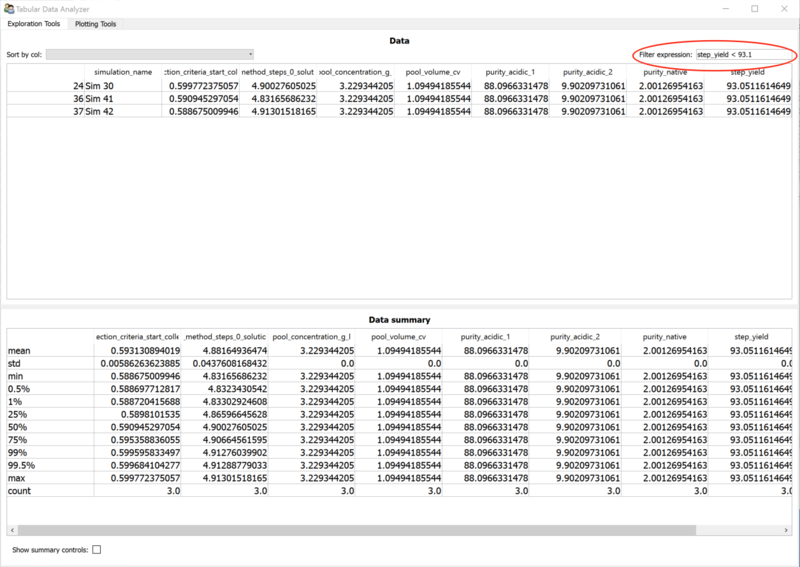 Users can also find it in the Study Data browser under Analysis Tools > Monte-Carlo explorations . Once open in the central pane, users can view the group’s name, type, the number of simulations it contains, and the name of the simulation it was built from. 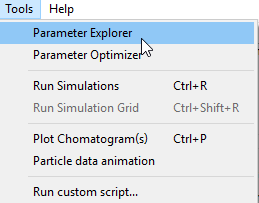 Below this information is a table displaying parameter values to be explored. The table will eventually display performance data including yield, pool concentration, pool volume, and component purities once it has run. If a parameter value being tested is unreasonable, for example leading to a chromatogram where the stop collection criteria is never reached, the table will not update that portion of the grid, and will continue to display a missing value (“nan”) in the corresponding row. Once the group has fully run, the performance part of the table will be filled, and the status will go from Running... to Finished running. To learn more about saving group simulations once they have been run, visit the Saving your work section. More exploration capabilities are available in the data analyzer (including filtering and plotting), available using the Analyze Data button. 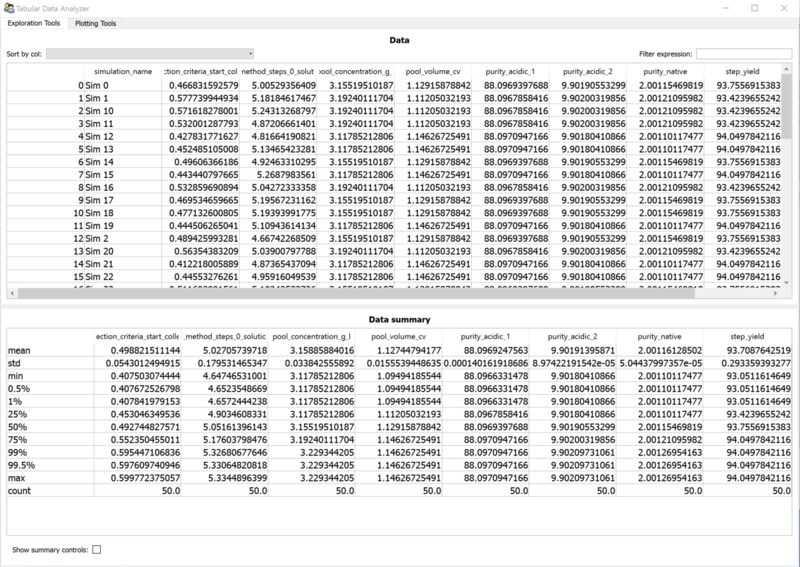 More on this tool in Analyzing Simulation Group results (PRO ONLY). For more custom explorations, the group data can also be exported as a .csv file selecting the Export Data to CSV button located directly below the table. 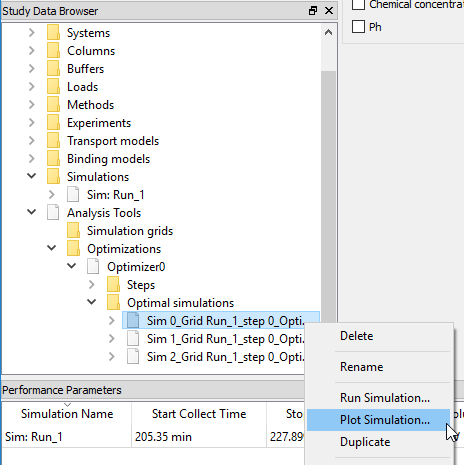 If a specific simulation is needed rather than chromatograms from all simulations in the grid, users can right-click on the desired simulation in the Study Data browser, and select Plot Simulation. If the simulation group was done to explore the parameter space rather than model calibration, instead of visualizing chromatograms, users may want to explore/summarize/plot the performance data computed in the group. For example, one may want to build a response plot to see how, say, the purity changes with the scanned parameter(s), visualize the distribution of yields over an entire Monte-Carlo exploration, or compute some statistics (for example its 0.5% and 99.5% percentile to see what is the predicted 99% range of values). Or maybe, one needs to filter the data to find out what set of conditions leads to a drop in yield. The Data Analyzer has two parts, each in a different tab. The first tab contains exploration tools, while the second tab contains plotting tools. Note that the separator between the top part (Data) and the bottom part (statistics) can be moved up and down as needed. The list (and order) of statistics being computed can be changed using the Show summary controls checkbox at the bottom. The summary statistics table will automatically update. 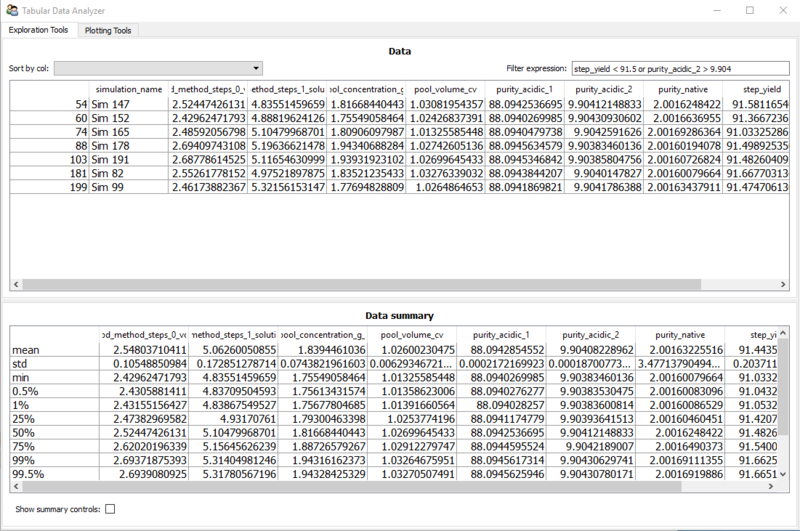 As you type the filter, the data table will update to only show the simulations that satisfy the filter criteria. Simultaneously, the statistics will update to be recomputed on the remaining (filtered) simulations. Inspecting the remaining simulation, it seems like their common trait is a very small load volume. Plotting, described in the next section, may confirm that observation. 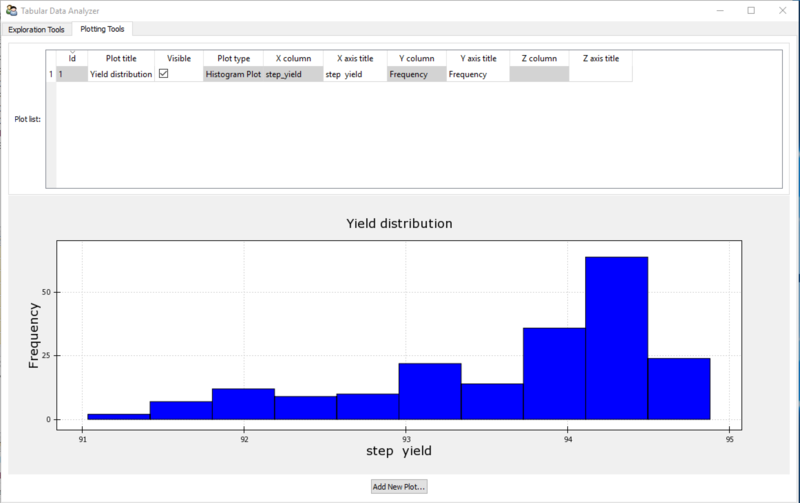 When switching to the Plotting Tools tab of the Data Analyzer, one can see that it is made of two parts: a control table that lists the plot content and a plotting dashboard below that can contain any number of plots side by side. 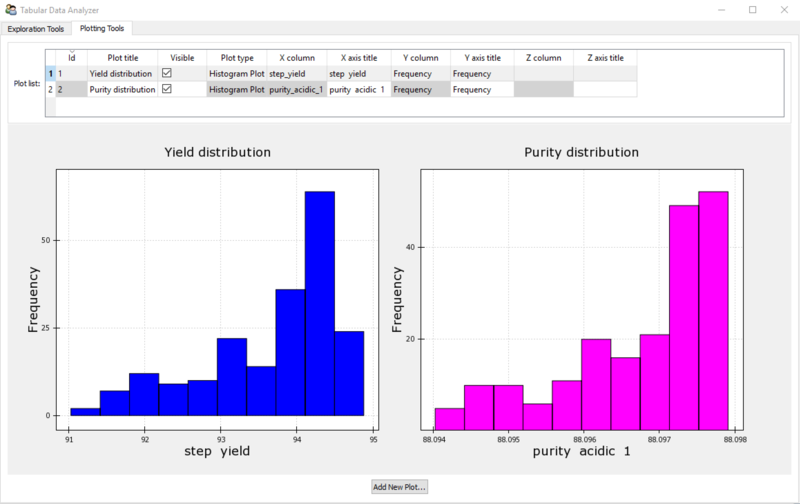 Histograms allow users to visualize the distribution of data, whether scanned parameters to make sure they were sampled as expected (uniformly or following a “bell-curve”) or performance parameters, for example during a process characterization, to see how purities or yields spread. A corresponding entry appears in the plot control table above, allowing users to edit the plot’s title, axis titles and hide/show the plot in the dashboard. What we learn from this histogram is that even though our parameter ranges lead to a yield mostly likely around 94% or above, the distribution is long tailed toward lower values, and therefore some portion of the parameter space can lead to values in the 91% range. These new plots were added using the same strategy as for histograms, but selecting Scatter plot as the plot type. In this case, a column for both x and y axes have to be selected, the styling tab allows to control marker type, color, and size among other things. Note that in the plot list, the second column allows to hide/show plots, so in the screen shot above, we hid the purity histogram. These response plots confirm what we had guessed when filtering the data: the load volume has a stronger impact on the step yield than the pH of the wash step. 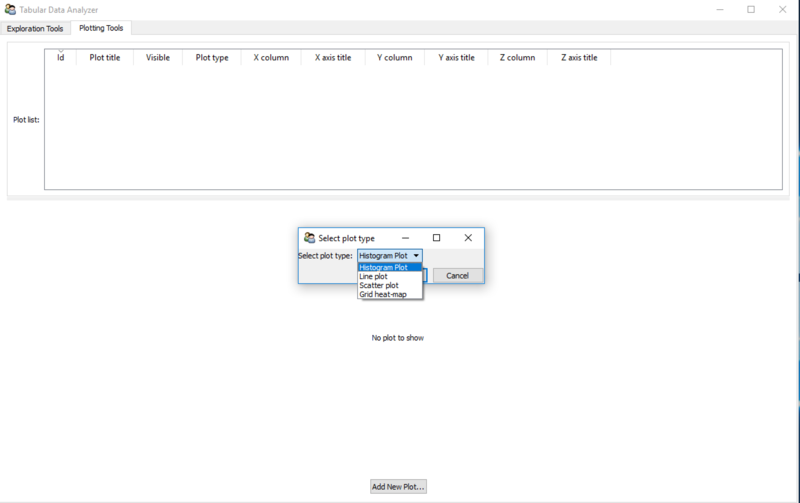 If a plot is not useful anymore, it can be deleted by right-clicking on its number in the plot list table, and selecting Delete item. 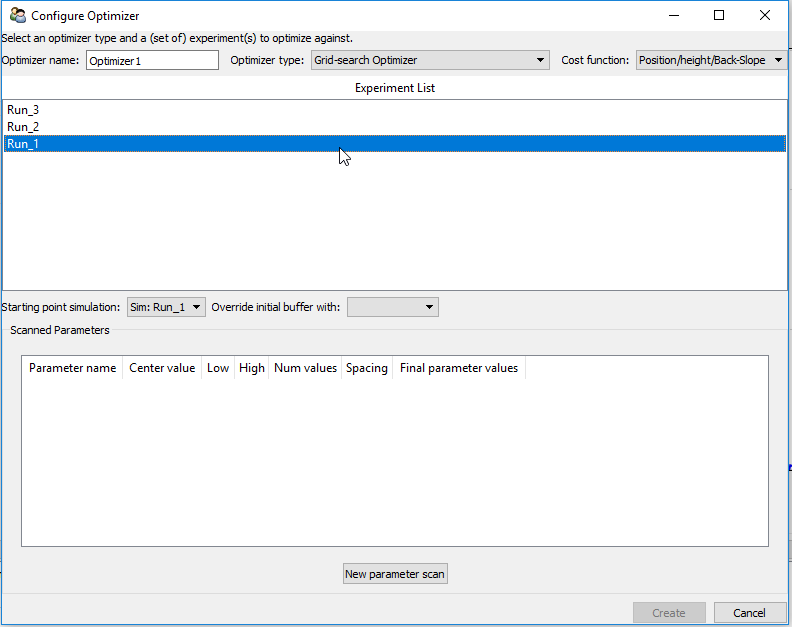 The Parameter Optimizer is a powerful tool that is used to find the optimal values of a set of parameters (binding model, transport model and/or operational parameters) to match one or more experiments. It is designed to simplify and speed up model calibration. 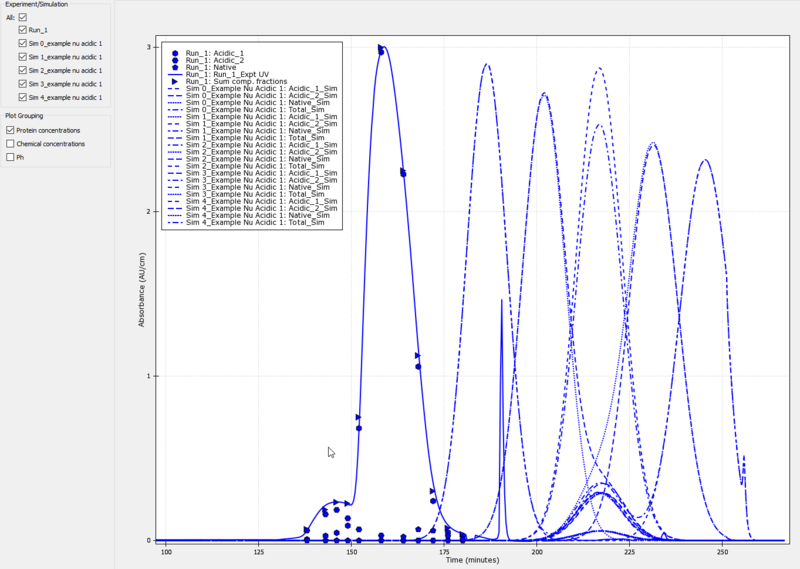 Reveal Chromatography’s Parameter Optimizer, find the best set of parameter values by minimizing a “cost function” which measures the alignment between the simulated chromatogram predicted by the chosen parameter values and one or more experimental chromatograms. 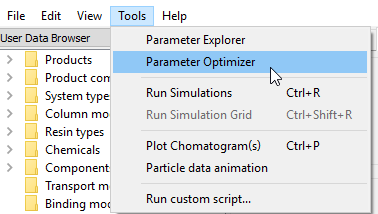 Within the Parameter Optimizer, there are currently two types of optimizers that can be created. Both types of optimizers implement a grid search-based algorithm, with a single step for the Grid-search optimizer and with multiple steps for the (experimental) Self-refining binding model optimizer (Experimental). The idea is to define a set of parameters to scan, create a grid of simulations that test these parameters, run all simulations in that grid, compute the “cost” for each simulation (meaning the distance/difference between the resulting chromatograms and the experimental chromatograms). This workflow can be done subjectively when using the Parameter Explorer tool (see Exploring the parameter space: Simulation Groups). The parameter optimizer automates that workflow. Parallelizable: A grid search approach is automatically parallelizable, meaning that simulations in the grid are independent from each other, and can be run at the same time, yielding speed on modern computers and clusters. The major limitation of a grid search approach is the amount of time and memory that is required which increases exponentially with the number of parameters explored/optimized. Other types of optimizers are under development for that reason. Stay tuned. It is possible to optimize some parameters across more than one experiment for a single product. Select multiple experiments by holding down the Ctrl key while clicking on each experiment. The rest of the optimizer configuration depends on the type of optimizer selected. Users may choose the type of optimizer to run. The most general and default type is the “Grid-search Optimizer”, which builds a simulation grid for each target experiment, and computes the cost at each point in each grid. 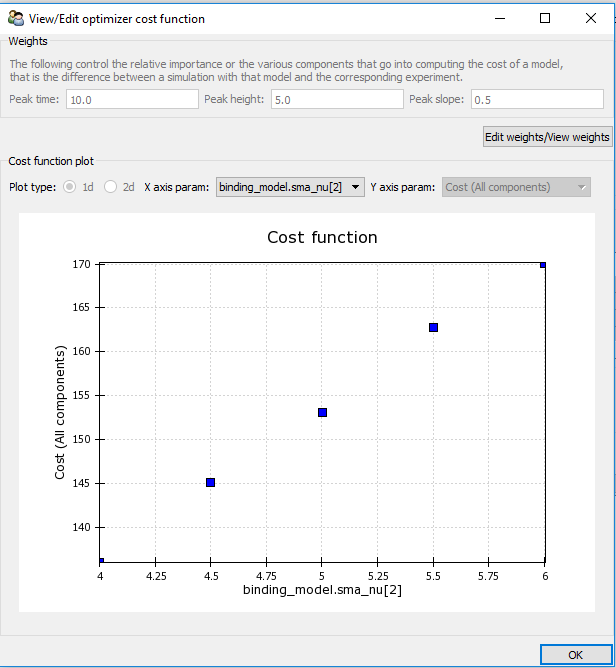 The cost of a parameter value is the sum of the costs across all target experiments. Therefore, the parameter value that is considered optimal is the one that provides the best fit across all target experiments. Next, users must specify a starting simulation from the drop-down menu. The starting point simulation will specify the first and the last method steps to model. Optionally, users may also override the buffers used as initial condition for the column in simulation grids. Leave this blank to have that information read from the experiment’s method. Clicking Create will create the optimization and add it to the study. 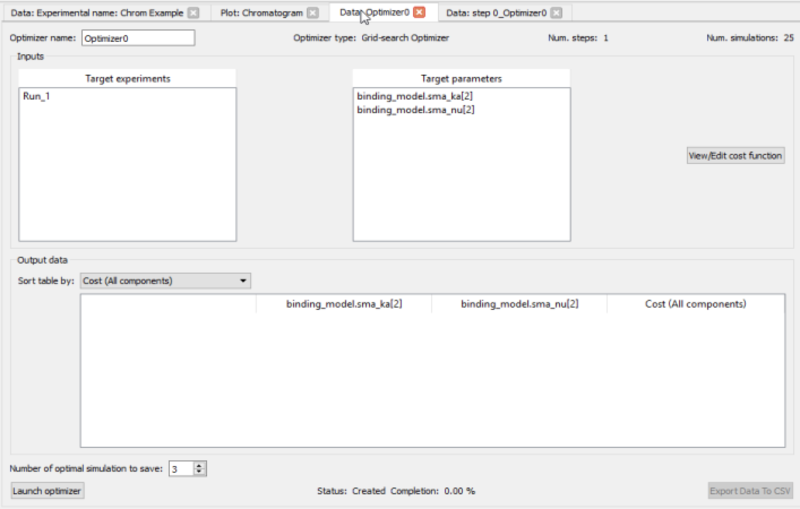 The newly created optimizer will automatically open in the central pane. It is also available in the Study Data browser, under the Analysis Tools > Optimizations section. The self-refining binding model optimizer (experimental) builds a multi-step optimizer, to optimize the SMA binding model parameters ka, nu or sigma, for all product component. The optimizer is still grid based, but avoids building a very large dimensional optimizer, scanning all parameters across all product component. That could lead to a computationally expensive task due to the number of dimensions, especially for products made of many components. That big of a problem isn’t the smartest way to go about calibrating each product component anyway since the correlations between binding model parameters across component are small. 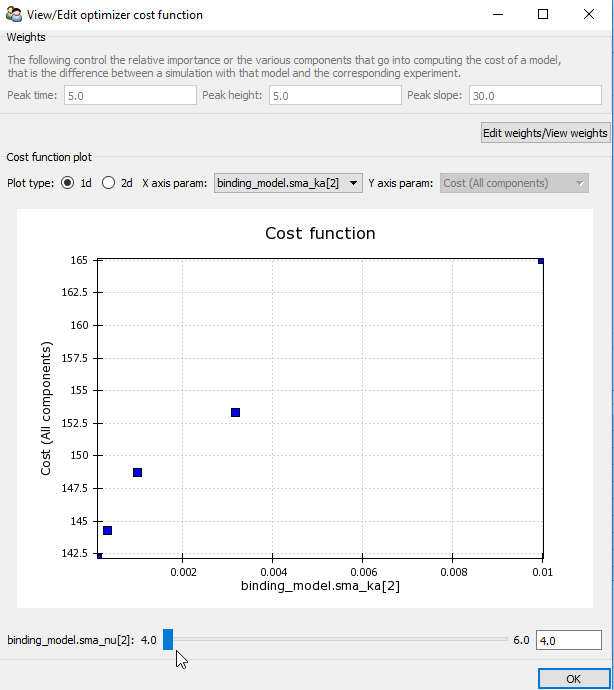 The binding model optimizer makes use of that, and builds a first step that applies the same value of the scanned parameter (ka, nu and/or sigma) to all components. That optimizer step is called the constant step. 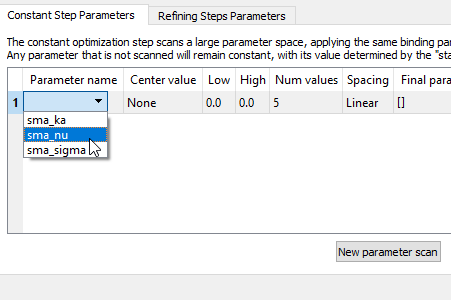 From that step, the best value for each component is extracted, and a refining optimizer step for each component is built and run, centered around the best value found during the constant step, and scanning the small portion of the parameter space around it. 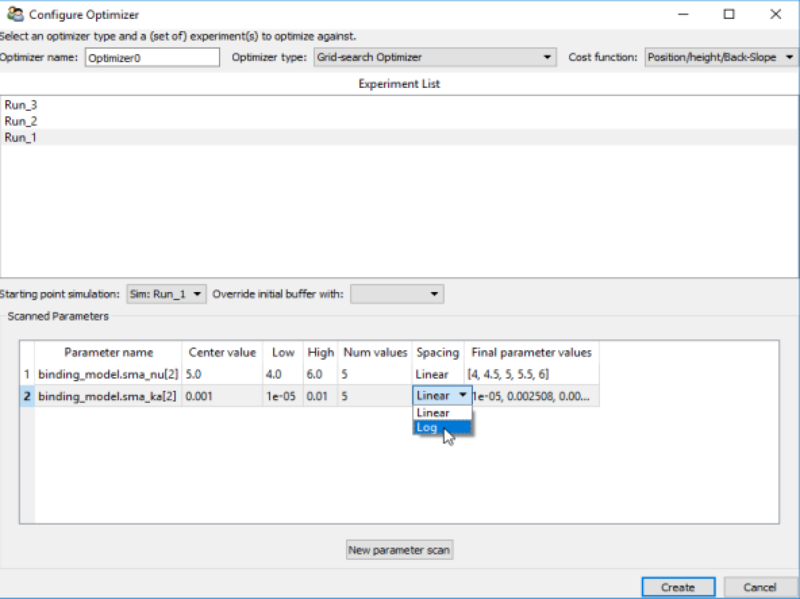 The newly created Optimizer’s central pane view displays the target experiment(s), the list of parameters that will be explored, the total number of simulations that will be run. That table will be updated at the end of each optimizer step’s run. Though optional, editing the cost function can be useful to achieve the best automatic results from a Parameter Optimizer, and the best cost function can depend on the parameters optimized and the specific chromatograms the user is trying to calibrate against. By default, the peak time is set as the most important, followed by the peak height, and the peak slope is set as the least important, but these may need to be tweaked depending on the shape and properties of the target chromatogram. Additionally, it may be useful to change these weights based on where the user is with the model calibration process. At the beginning, peaks may not be aligned at all, and the peak’s back slope isn’t an important parameter. It may become useful to increase its weight once parameters have been optimized to the point where the simulated peak position is close enough to the experimental one, and the user is now more focused on reproducing that back slope to improve the predicted stop collect time or the pool’s volume and other properties. 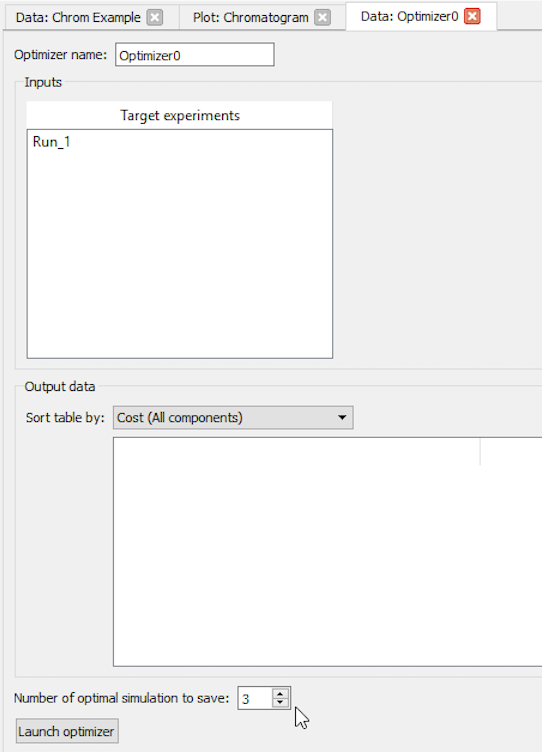 Once the optimizer completes its run and cost function computation, the Status will become Finished running and the output table above will be populated with cost data, sorting the table by costs by default. It can be useful to increase that number to inspect or plot more simulations, for example to see if the optimizer’s ranking matches the user’s choices. 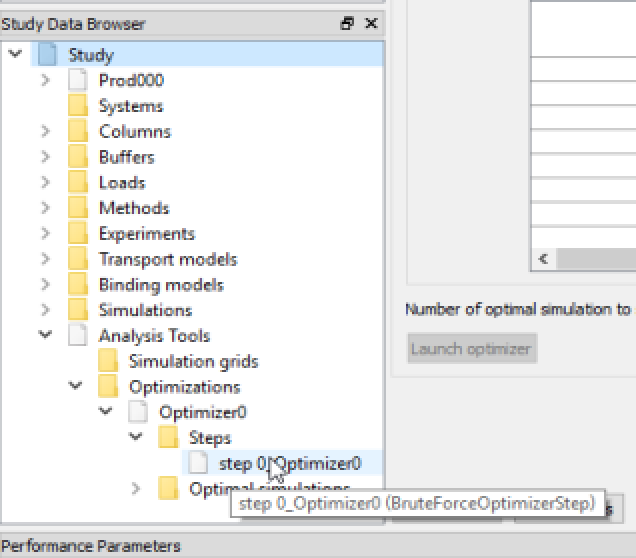 Note that optimal simulations of an optimizers get stored in the project file. Consequently, it is not required to copy these simulations from that folder into the study to retain them, except maybe to provide a starting point for a future simulation grid. Consequently, to reduce the size of the project file, it is recommended to reduce the number of optimal simulations to the minimum needed by the user. 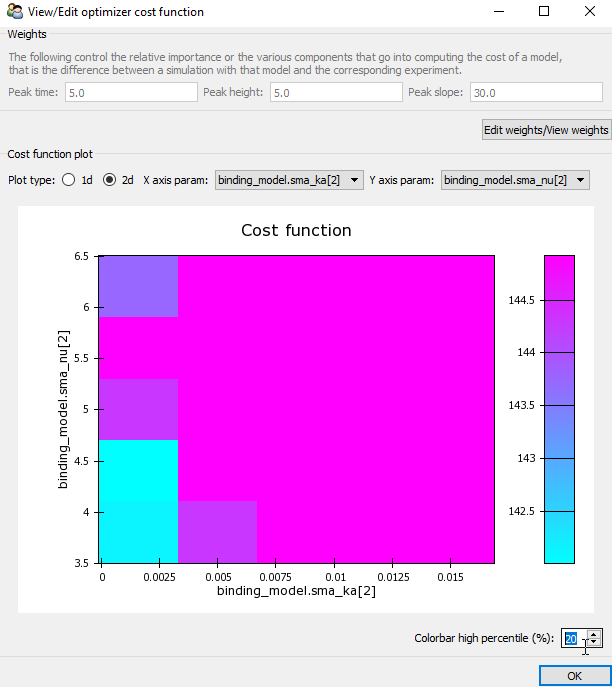 Any of the optimal simulations can be plotted (one at a time), by right-clicking on the desired simulation in the Study Data browser and selecting Plot Simulation. By default, the heat map’s color bar doesn’t span the full range of cost values, since high costs correspond to a part of the parameter space that is typically not of interest. The color bar range is controlled by the “Colorbar high percentile” control below the color bar, set by default at 50% . That means that any cost above half of the max cost is represented by the same (high cost) color. Simulating chromatography processes, is a time-consuming and resource intensive process. In particular, the CADET solver at the core of Reveal computes for every simulation the state of each product component, at each time step in the solution, and at each column spatial step and bead spatial step. This is what allows Reveal to display component concentration states over time and over the column in the Particle Data animation tool. Both the amount of RAM and the number of CPUs will impact the speed of a given study/exploration. Too little RAM will lead to disk swapping, and have a dramatic impact on speed. More importantly, the size of available hard drive space will limit the size of the exploration that can be run, and too little space will lead to a failure of the exploration. It is therefore important to pre-compute the needed space before running an exploration. If you need support for multi-node cluster type resources, please Contact us. the space resolution of the column and bead discretization. 2 TB of available hard drive space. In this example, the analyzed product contained 5 components and the center-point simulation was set up with 15,000 time points per time step. Each simulation, once run, led to the storage of a 400+MB file. Building a 10,000-simulation grid with that setup would by default use 4 TB of disk space! By comparison, a simulation with the same number of components and the default 2000 points per time step leads to a 45-50 MB file size. But the ability to delete CADET files along the way allowed to reduce that usage to 2 TB. Ultimately, the time and amount of hard drive space used ended up controlled by the shortage of RAM, and dramatic speed ups and with enough RAM, disk usage is kept under a few GB. The largest Reveal study conducted by our group required multiple fine-grained optimizations, each exploring ~200,000+ simulations. It was run on a Linux compute server, with 40 CPUs, 128GB of RAM, which uses the SLURM resource scheduler (requires Reveal version 0.10). That server allowed to blindly calibrate all binding model parameters for 5 product components in ** hours (running a total of * simulations). Create a small version of the full grid, and monitor the run time per simulation, RAM usage and CADET file sizes. Extrapolate to the needed grid to make sure enough RAM is available and compute the expected run time. Review the advanced simulation settings, in particular the solver’s time resolution and the space resolution of the column and bead discretization (see the Show Advanced Parameters button in the center point simulation view). Review the Solver settings in the Preferences, to make sure the that product of the number of workers and the number of CADET threads isn’t larger than the number of available CPUs. Otherwise, CPU over-allocation will trigger (sometimes serious) performance degradation. The symptom of this issue is single CADET job times higher during exploration than when a single simulation is run. To avoid memory overflow/disk swap, request the simulation groups to store simulations on disk rather than in memory (see the check-box at the bottom of the panel to build new simulation groups). To avoid hard disk overflow, delete simulation files along the way, when doing process optimization/characterization, since the purpose of these explorations is to analyze performances. Again, that can be controlled when building new simulation groups (check-box in the bottom right of the builder panel). Note that, depending on the available memory and the number of CADET running CPUs ( Edit > Preferences... > Solver > Executor num worker ), CADET files may still occupy a significant amount of disk space while waiting to be post-processed, and therefore the exploration may still require a significant amount of disk space. Disk usage, memory usage, disk swapping and logs should be monitored closely while running the exploration to anticipate issues and potentially free up more disk space if needed. Feel free to Contact us for support to run large-scale Reveal explorations. © Copyright 2016-2018, KBI Biopharma Inc.. Created using Sphinx 1.4.1.